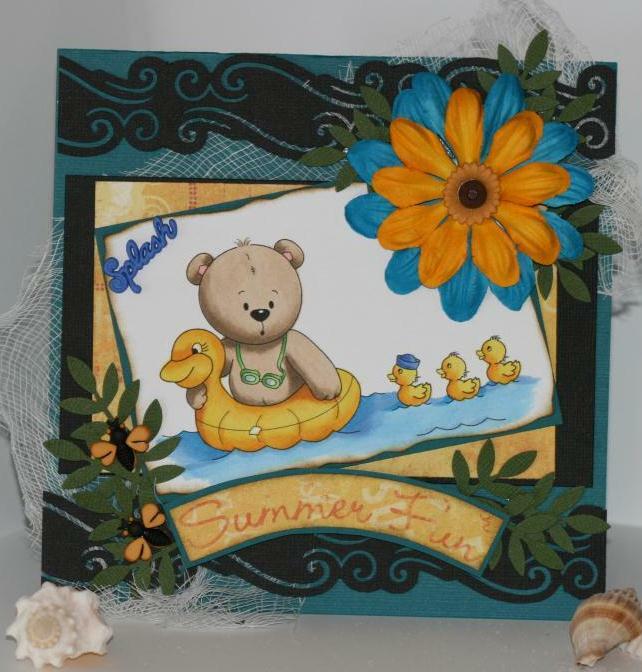 AlreadyWednesday July 25 so you know what that means time for another challenge at Whimsy. This week it is Summer Fun. That makes the challenge pretty easy, you can intrepret it just about with anything summer. I chose to use this new digital stamp from Stampart Design by Kathryne from Whimsy Stamps. Click here to check out Kathryne"s blog. The digital stamp is called Little Bear Ducky. I love these super adorable bears, they are so much fun to work with. You should try them. Maybe add your project or card to the Whimsy Challenge blog and you will have a chance to win some really great digital images. or just click here to check out all the wonderful digi stamps at the Whimsy Stamps Store. I would love to see you win some digital images. You can also click here to jump over to the Whimsy Challenge blog to see all the talented, wonderful creations by the Whimsy DT team. So on that note here is my card for this weeks challenge. I had no idea what I was going to do for my card this week it just kind of came to me as I looked around my scrapbook room for stuff to put on it. It started with the black punched strip on the bottom of my card. Then it just flowed from there, I think summer fun is having fun in the water with friends or with family. I really don't think that age matters when it comes to water fun do you? A closer look at that cute little bear digi image all colored. Supplies:Whimsy digi image, copic markers, Bazzill cardstock and flowers, EK border punch, Martha Stewart leaf punch, miscellaneous buttons, cheese cloth. Hope to see you really soon. OMGOSH, he is super cute, love the paper/colors you picked out. Awesome job! Cool, cheese cloth, I might snag that too...great job...love it. TFS!